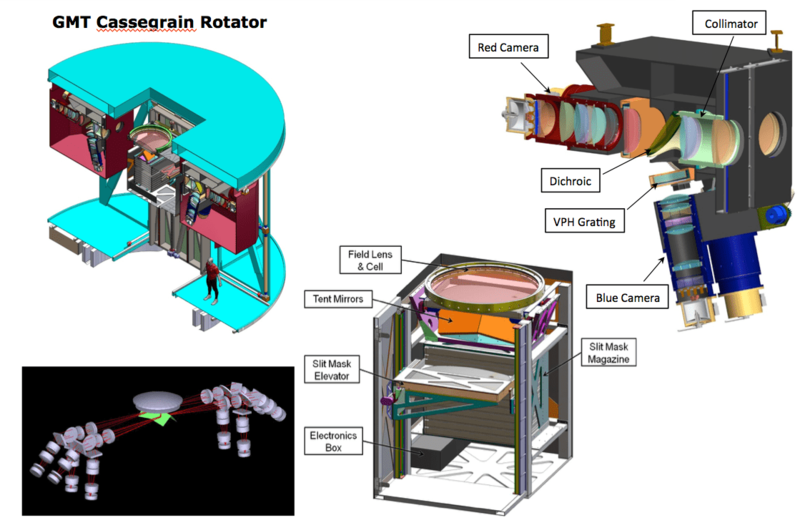 The Johns Hopkins University IDG is partnered with Texas A&M University on the development of a wide-field optical spectrograph for the Giant Magellan Telescope (GMT), GMACS. 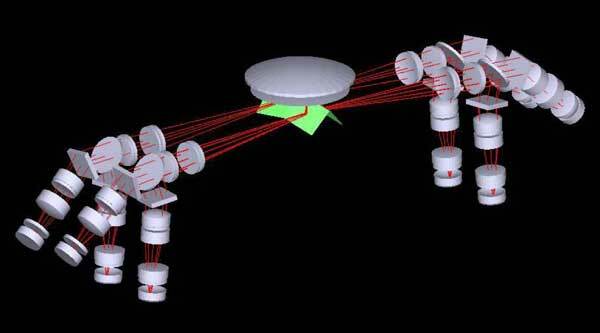 Based on the concept put forth by Stephen Shectman of Carnegie Observatories, the GMACS design will provide simultaneous wavelength coverage between ~0.36 – 1.02 um for hundreds of objects in an 8 x 18 arcmin field of view. The optical layout is a four-arm, two-channel, design. A wide field corrector provides well resolved images accross the field. Fold mirrors direct the beams to one of four channels, each of which consists of a refractive collimator, followed by a dichroic to split the beam into red and blue channels. Light in each channel is dispered by a volume phase holographic (VPH) grating and then imaged by a f/2.25 refractive camera. GMACS is currently in the conceptual design phase and has been selected as a first-light instrument for GMT.